The Bullmastiff is an imposing breed. Developed by 19th-century English gamekeepers to stand guard over country estates and typically weighing between 110 to 130 pounds, they give any intruder second thoughts. However, as everyone knows, looks can be deceiving. Bullmastiffs are also notably quiet, mild-mannered and, if properly socialized, affectionate, gentle and calm. 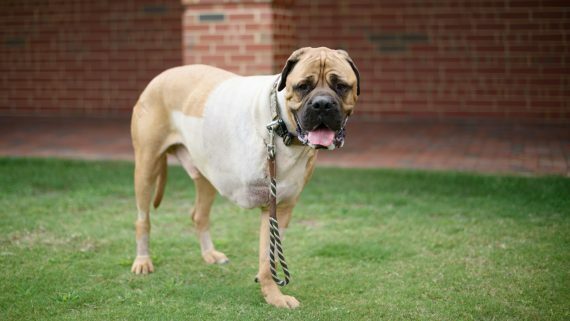 That is an excellent description of Rocky, a 6-year-old Bullmastiff belonging to the Sizemore family of Huntersville, N.C.
Matt Sizemore calls Rocky “my buddy,” and he enjoys long walks and visits to the U.S. National Whitewater Center in Charlotte. They’ve been together since Rocky was 8 weeks old. This summer, Rocky jumped off the bed — big or not, he’s part of the family — and landed with a whimper. He walked with a limp on his right side for a couple of days. Matt and his wife, Jackie, kept an eye on him, and the limp soon disappeared. They concluded that it was just a temporary injury. About a month later, one of the Sizemores’ other dogs bumped into Rocky’s right front shoulder. Rocky responded with a yelp — and the limp returned. This time he was given an anti-inflammatory by his primary care veterinarian, but after a week the limp had not improved. Initial X-rays didn’t reveal a problem, and Rocky was referred to a specialist, who identified telltale signs of osteosarcoma, or bone cancer. A referral to the NC State Veterinary Hospital quickly followed. In August, Rocky was admitted to the Veterinary Hospital’s medical oncology service, where he had a chest radiograph and an abdominal ultrasound. The original diagnosis was confirmed, but there was no evidence that that cancer had spread. He was then transferred to the soft tissue surgery service. The decision was made to remove his leg at the shoulder. Dogs generally adapt well to the loss of one limb, although losing a foreleg is somewhat more difficult since dogs carry 60 percent of their weight with their front legs. 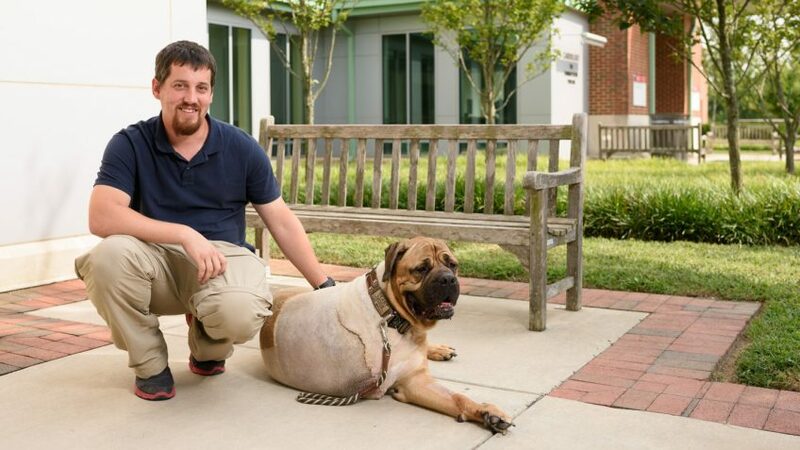 However, Kyle Mathews, the professor of soft tissue and oncologic surgery who performed Rocky’s surgery, said that because Rocky had been avoiding putting weight on his leg because of the pain, he had a head start on adjusting to the use of just three legs. Rocky bounced back from surgery with flying colors and with the active assistance of his owners, he is recovering remarkably as he continues chemotherapy treatments to impede cancer spreading to the thorax, a common issue with osteosarcoma. It helps that the Sizemores are active partners in helping Rocky. Matt recently acquired a sturdy harness that better accommodates Rocky’s massive chest. The harness assists Rocky with more challenging maneuvers like getting in and out of the car. Rocky’s illness also came at a challenging financial time for his owners. Jackie gave birth to their first child, daughter Scout, during the same period. Fortunately, NC State is the recipient of a generous grant from the Petco Foundation to assist pet owners with paying for companion animal cancer treatment. The expense of providing pets with the comprehensive therapy required in cancer cases is frequently a barrier to getting treatment. This, in turn, impedes learning more about the most effective ways to treat these cases. The Petco Foundation grant provides the double benefit of helping pet owners afford treatments for their beloved companions and helping clinicians learn from increased experience managing different kinds of cancer cases.